Whoa - here we go! 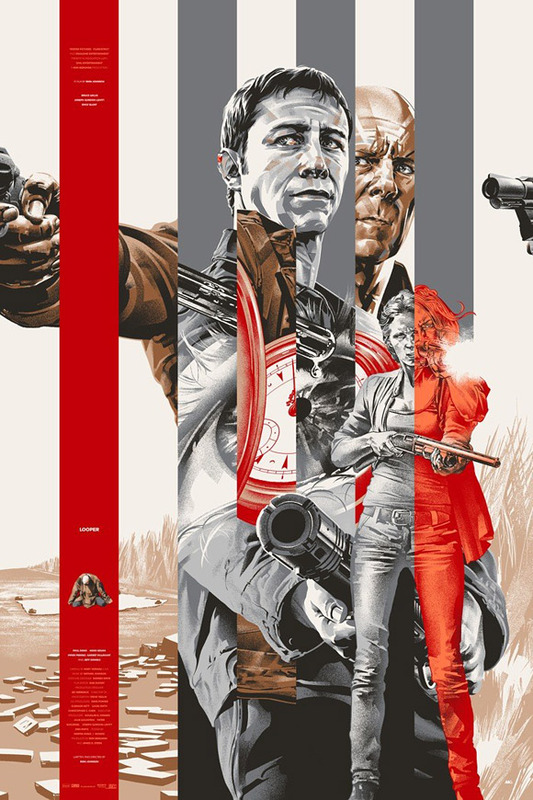 I was waiting to see if we would get some kind of awesome artwork for Rian Johnson's Looper beyond that very simple studio-released poster, now we finally have it. Moviefone has debuted the new Mondo poster for the Fantastic Fest Looper screening, designed by Martin Ansin. It's badass. Why? Because it has some nifty inter-cutting between the two characters, Joseph Gordon-Levitt and Bruce Willis, who are the same person from different times. I love it, and I've seen the movie and I love it, too, so I'm happy to see some fantastic artwork for it. There's an alternate colored version to see as well. Check it! Here's the alternate version, which has cleaner colors - I like this one a lot more. I need to get one of these! Wow. It captured the overall plot perfectly. Great poster, it is a well thought out concept. I've heard great things about this movie, I can't wait to catch it myself. Was this in competition at TIFF? Yeah, the non-sepia toned version is much much better.